Duac Once Daily 60g Gel is a white to a slightly yellow coloured gel containing two active ingredients - Clindamycin and Benzoyl Peroxide. 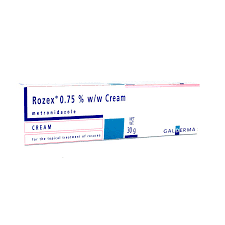 It is used in the treatment of moderate acne on the skin. 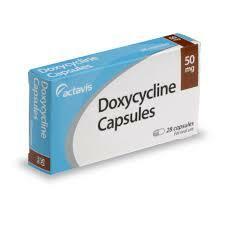 Clindamycin is an antibiotic, which stops the bacteria involved in acne from reproducing. Benzoyl Peroxid reduces blackheads and whiteheads. It also kills the bacteria involved in acne. 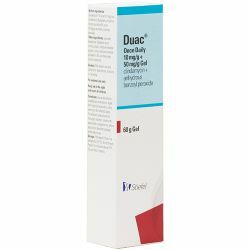 Duac Once Daily 60g is the high strength version of the product and is available in 25g or 50g tubes. It is suitable for use in adults and adolescents aged 12 years and over. Duac Once Daily 60g should be kept out of reach and sight of children. It should not be stored above 25 degrees celcius and should be discarded 2 months after opening. When using Duac Once Daily 60g Gel, you should follow the instructions given to you by your doctor. Duac is for external use only. It should not be used for more than 12 weeks at one time. Wash the affected area well, rinsing with warm water and pat drying. Put a thin film of gel on the entire area of infected skin, using your fingertips. Apply to the entire area of skin which has acne, not just to individual spots. If the gel does not rub in easily, you are using too much. Wash your hands after use. If you use more Duac than recommended, it will not help get rid of your acne any quicker, but it may cause your skin to become irritated and red. If you forget to apply the Duac, do not worry, just apply the gel when you next remember, the same way as before. The active ingredients in Duac Once Daily 60g Gel are clindamycin and benzoyl peroxide. Other ingredients include carbomer, dimeticone, disodium lauryl sulfosuccinate, disodium edetate, glycerol, silica, colloidal hydrated, poloxamer 1B2, purified water and sodium hydroxide. Duac Once Daily 60g Gel should not be used if you are allergic to any of the ingredients in the medicine. You should not use Duac on areas where you have cuts, scrapes, sunburnt skin or if you have the skin condition eczema. Avoid contact with the eyes, mouth or angles of the nose and other sensitive areas of your body. If accidental contact does occur, wash immediately with warm water. You should avoid exposure to strong sunlight and artificial UV light. Use of sunscreen products and protective clothing over the treated area is recommended. Try not to let the product come into contact with coloured fabrics, including clothing, towels, bed linen, furniture or carpeting. Duac can bleach these materials. It can also bleach hair. Before using Duac, you should make sure your doctor is aware if you have ever had any gut problems (regional enteritis, ulcerative colitis or antibiotic-associated colitis). You should make sure to mention if you are taking any other medicines, including medicines obtained without a prescription. Using Duac Once Daily 60g Gel with other acne treatments including antibiotics on the skin, medicated soaps and cleansers, soaps or cosmetics that have a strong drying effect and products which contain large amounts of alcohol or astringents may irritate your skin over time. 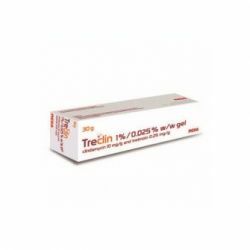 Duac may make medicines containing tretinoin, isotretinoin or tazarotene less effective if used at the same time. You may need to use them at different times in the day. Duac should not be used at the same time as medicines containing erythromycin. Applying Duac at the same time as medicines such as dapsone and sulfacetamide can cause a temporary colour change of skin or facial hair. This is not permanent. One of the medicines in Duac can affect how certain general anaesthesia medicines work. If you are pregnant or breastfeeding, think you may be pregnant or are planning to have a baby, ask your doctor for advice before using Duac. It is not known whether the ingredients of Duac can pass into breast milk. Once of the medicines, clindamycin can pass into breast milk if taken by mouth or injection. If you are breastfeeding you should consult your doctor before using Duac. As with all medicines, Duac Once Daily 60g Gel can cause side effects, although not everybody gets them. You should stop using Duac immediately if you notice any signs of an allergic reaction, severe or prolonged diarrhoea, abdominal cramps or severe burning, peeling or itching, If these effects occur, you should speak to your doctor straight away. Other common side effects include skin burning sensation, peeling, itching or dry skin, redness of the skin, headaches and, at the site of application, sensitivity to sunlight, skin pain or red, itchy skin and rashes. Uncommon effects include tingling, worsening of acne, allergic reactions, inflammation of the intestine, diarrhoea, including bloody diarrhoea, stomach pain, skin reactions at the site of application and raised itchy rashes. If any of these side effects occur, you should speak to your doctor.